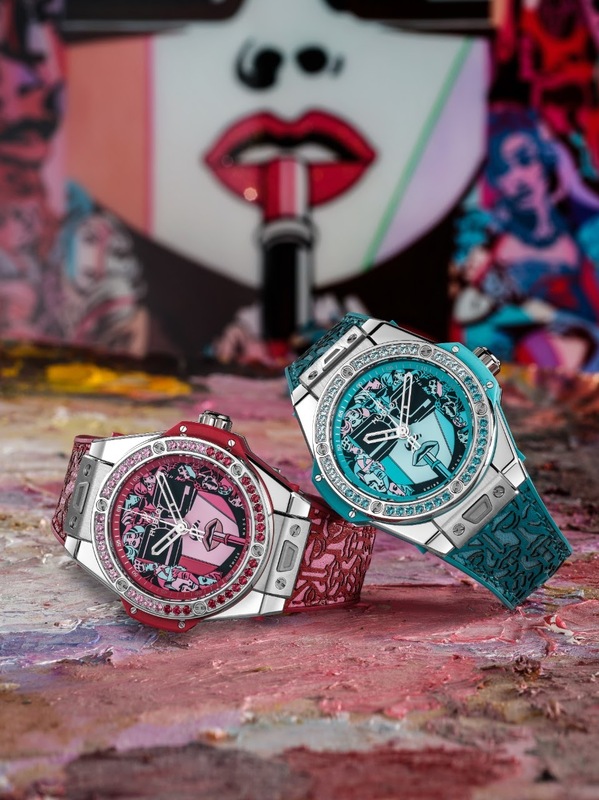 Hublot and Marc Ferrero, the artist behind Storytelling Art, unveil the Big Bang One Click Marc Ferrero. Paying homage to the 21st century woman, who distinguishes herself through the multiplicity of her roles, in this exclusive timepiece she is embodied as the heroine of modern times. 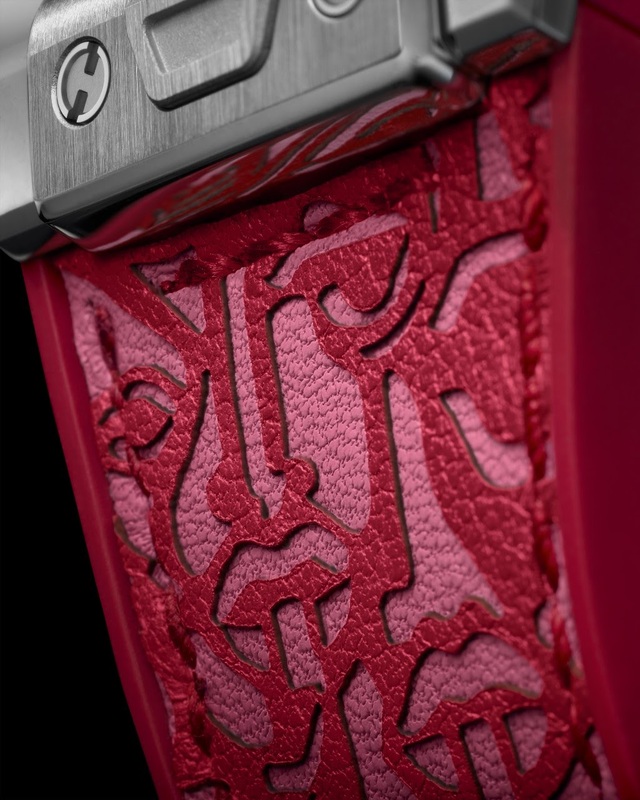 This collaboration marks an exploratory approach to art and watchmaking. 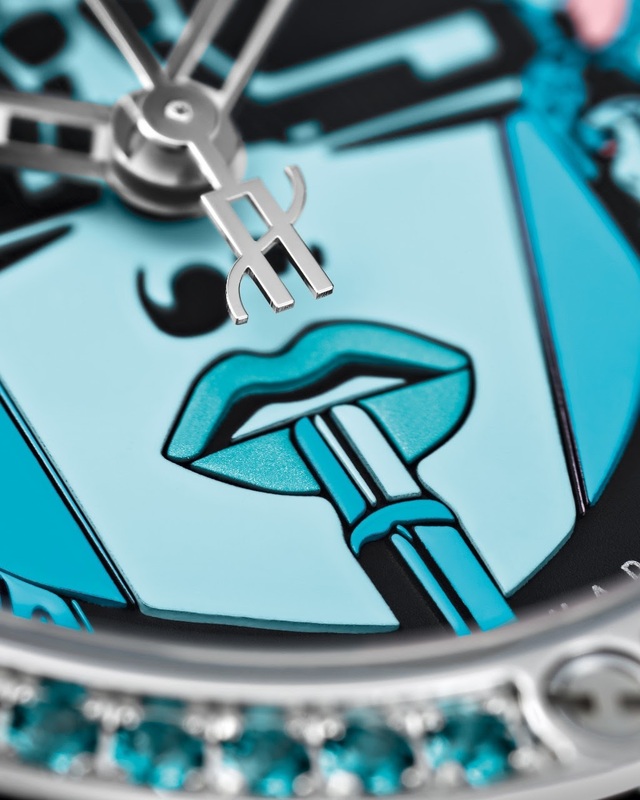 Big Bang One Click Marc Ferrero The dial tells the story of this heroine of modern times with ‘Lipstick’, an iconic work by the artist. Enigmatic behind her dark glasses, she remains majestic in the face of the unexpected and affirms her femininity, armed with her lipstick. 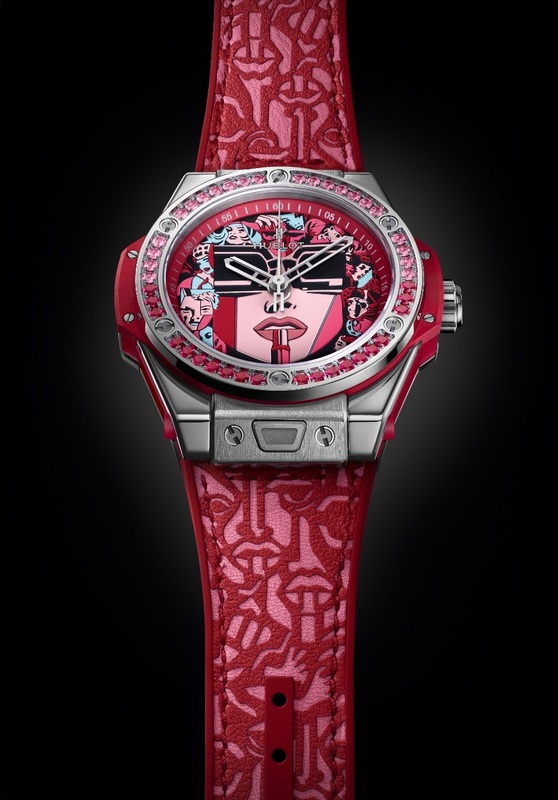 Spinels in shades of red, topazes for the turquoise version, and forty-two fine stones decorate the bezel of the new 39-mm case, which is adjusted to her feminine wrists. With one touch of its “One Click” patented fastening system, the leather strap makes way for a version in alligator and rubber, a touch of sophistication appropriate for the moment. Available in red and turquoise, the special series will be available in 50 copies of each tone. 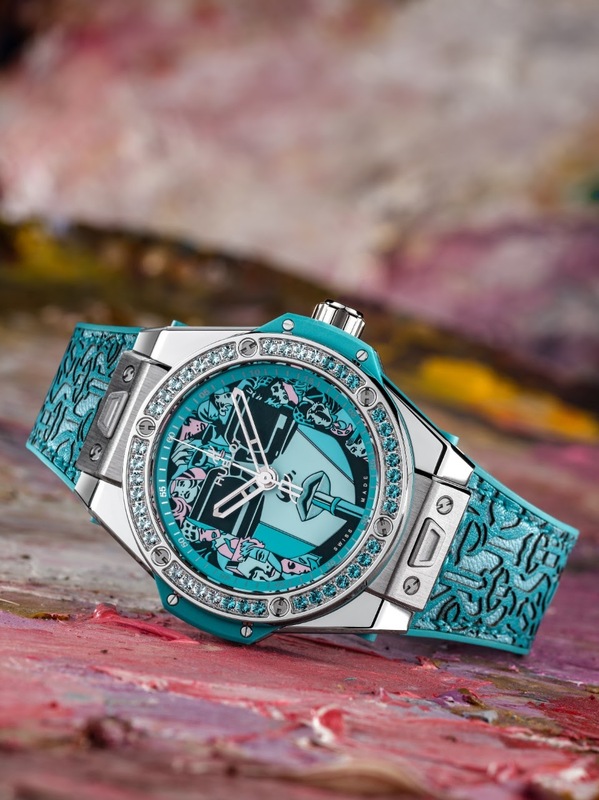 Watchmaking and painting in movement: fusion Hublot and Marc Ferrero cultivate the art of exploration in their respective fields, with fusion as the guiding principle. 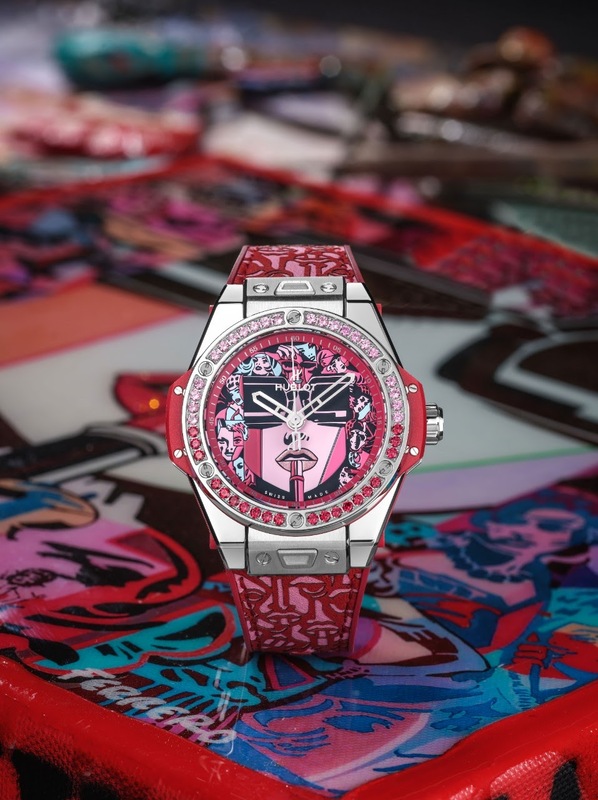 For the watchmaking house, it is the unexpected blend of rare and innovative materials and for the artist and friend of the brand, it is the combination of different graphic styles on the same plane. It was therefore natural for their innovative spirits to find a shared expression, with watchmaking as a vehicle for art. A story of timeless adventures is embodied by the Big Bang One Click Marc Ferrero timepiece. 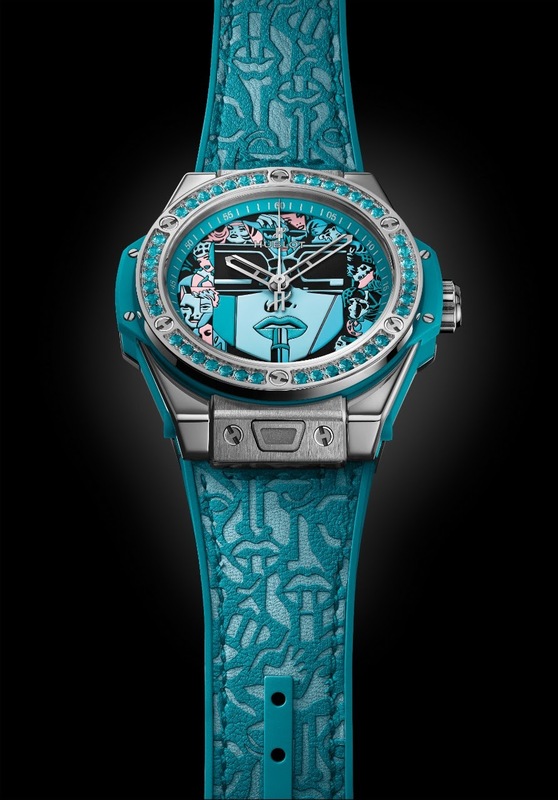 A flagship announcement linking to the “Hublot loves Art” series. You don’t position yourself at the head of a new pictorial trend without a great knowledge of painting and the major developments that have marked its history. Marc Ferrero is one of the few contemporary painters who make it possible to claim that painting can still explore new avenues and continue, thanks to the power of the imagination, last century’s graphical adventure, which was the richest in terms of pictorial research. Marc Ferrero’s body of work, associated with the Storytelling Art movement never ceases to intrigue because it possesses characteristics that are found nowhere else: fictional stories that take us around the world and refer to all kinds of cultures and invented characters, like real mirrors of the collective aspirations of our times. A forgotten mix of all sorts of graphic styles on the same plane, which modifies the notions of space-time of the pictorial field. An interplay between narrative breakdowns and variations of planes that allow each Work to be the pretext for an extraordinary adventure. 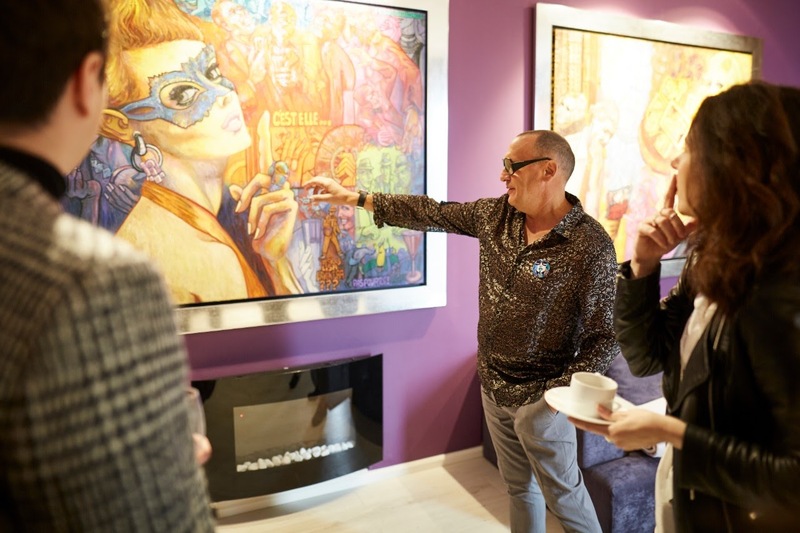 Living with a work by Marc Ferrero means giving your walls captivating stories and expanding spaces by following in the footsteps of Lisa L’aventura, Duke Spencer Percival and Cello Cordoba in an adventure that is called: “Once Upon a Time La Comitive”. He and has wife have a beautiful gallery in Eze which we discovered maybe 10 years ago. Looks like slot of people will go gaga over this collection.